In rural Kentucky where 26 percent of children live in poverty, children face many challenges at home and in school. But with help from our sponsors, our sponsorship program is giving children in the United States the skills they need to succeed, and the opportunity for a brighter future. 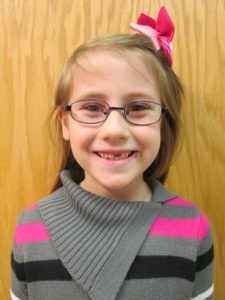 Sarabeth just started second grade and loves participating in the sponsorship program at her school. 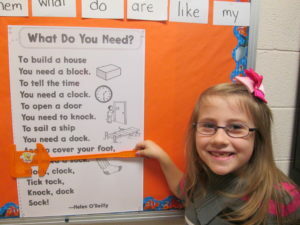 When asked how reading makes her feel, Sarabeth answered, “It makes me smart”. You can find her reading her favorite book, Dinosaurs Don’t Eat Broccoli, or dreaming of going to college and becoming a doctor when she grows up. Sarabeth participates in sponsorship programs which help improve her reading skills. Sarabeth didn’t always love reading. She was referred to Save the Children because her reading assessment scores were low and she was falling behind her peers. Since joining the program and getting the support she needs, Sarabeth has shown great improvements in more ways than just one. Her teacher, Mrs. Collins, reports that she has seen a difference in her reading comprehension, spelling and vocabulary skills. “I’ve seen much improvement in Sarabeth and look forward to seeing more at the end of this year,” she says. 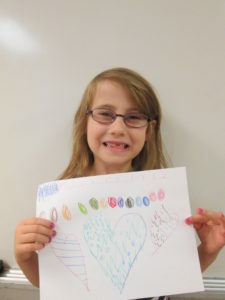 Sarabeth proudly shows her drawing. Sarabeth and so many children like her in Kentucky are making great progress, thanks to sponsors like you. We’re excited to see where Sarabeth goes next – it seems like the sky’s the limit!